I am so thankful for San Francisco’s second summer right now. And how lucky am I that it fell on the few days I’m here! Also, our school schedule for the rest of my nursing program was posted today and it really sunk in how close (sort of) to being done I actually am! I told you about them yesterday when I also showed you my boots, and it turns out, they are delicious and you should make some to eat as a snack this week! So, here’s the recipe. From Canadian Living. Sorry, no pictures for you today, but I assure if I could I would have taken a picture of how awesome it made my house smell. In a large bowl, mix together everything but the chickpeas. Drain and rinse the chickpeas, pat them dry with a towel. Add them to the bowl and stir it up! Spread them on a cookie sheet (I used my cast-iron pan because I love it and then you can easily shake the pan by the handle to stir them in the oven) and bake at 400 F until golden, crisp and dried, stirring occasionally. The recipe says 35 – 38 minutes, but I did that and they were still kind of soft in the middle, so I popped them back in for another 15. I am finally ready for this Vancouver spring weather. 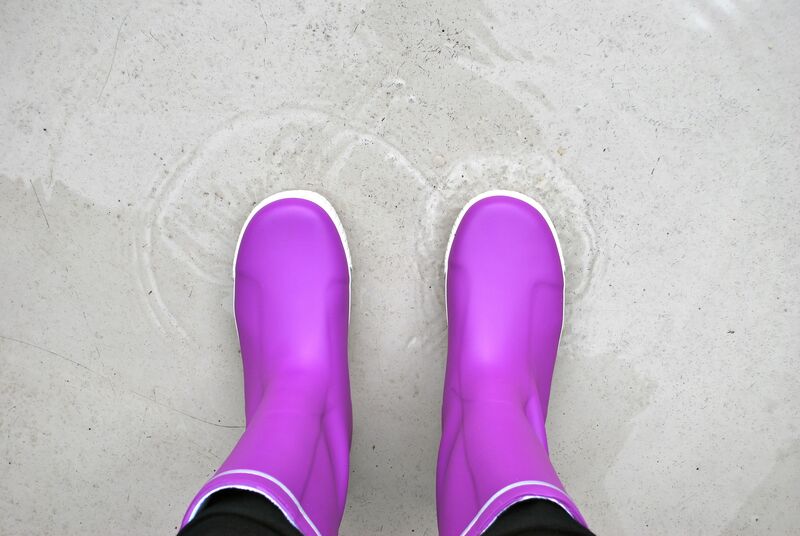 I made it through winter with my leather boots, but this spring is bringing such heavy bursts of rain, I needed something to keep my feet a bit drier. My feet are so happy! I’ve been wearing them around my kitchen while making some roasted curry chickpeas for a snack this week. Pretty soon, I’m going to head out on my bike to a coffee shop to do some studying this afternoon: it is bike everywhere week this week after-all. 2 more mugs: before going into the kiln. I’ve started pulling the handles on my mugs rather than rolling them – something I’ve been working on for ages! Hopefully soon I’ll have these plus a couple more, another bowl and a tiny little salt cellar glazed and finished. When I do, I’ll put them up here so you can see how they turned out! The new year starts with a new semester. There are new to-do lists, new text books, and new challenges. My new year’s resolution? Discover the things people love about Vancouver, explore them and get to writing about this new city again! My goal: one post each month. I know it’s not that much, but between school and writing about other things, one each month is achievable. So I’m putting it to you: what’s your favourite thing about Vancouver? One great thing about being here is how much I’ve been able to visit my family and friends in Victoria. Check out the cute hippo I got to cuddle this weekend. I am so happy tonight – I found a pottery studio! It turns out that UBC has a pottery club. And it’s amazingly reasonably priced. So, now I have a studio where I get to go and make things. Hip hip hooray! Also, the pottery club seems to be full of talented, very nice people. I’m hoping it will be a great way to meet people outside of nursing. And to top it off, one of the potters there was making yarn bowls! Something I’ve always wanted to make. Then to top off the topping it off, the noodle restaurant was open beside the studio and I picked up some won ton soup for dinner. This is my go-to feel good food. Not that I needed it tonight, I was feeling so good. But, I got some anyhow and it is delicious. A very happy day indeed! Stay tuned for pictures of new pottery pieces. Check out what my fabulous sister sent to me in the mail! What a thoughtful present. 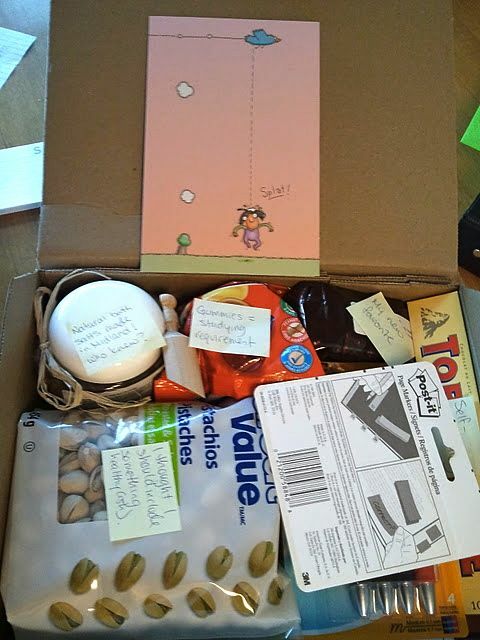 She sent me snacks, her new favourite tea and post-its and pens, some Archie comics (because we used to read them religiously), a Martha Stewart magazine to dream over and some beautiful smelling natural bath salts. And the part that made me smile the biggest was that she put little notes on each thing! What an amazing gift! And yes, the card has a bird pooping on someone’s head. On the inside is the promise of things getting easier. It’s great having a sister who has done something very similar. She went to law school away in Ontario and her husband lived in a different city. She has spent many hours listening to my complaining about school already. Thanks, J! I sat down this afternoon and wrote out and these fabulous weekly post-its everything that I have to do until I go home to San Francisco at Christmas. If I can get through those 8 sticky notes, I will have made it through the first of five semesters of the Nursing program at UBC. I can’t wait until the end of this week when I get to take that first one down, scrumple it up and recycle it. Then soon, they will all be done and I’ll be with my Prince Charming for three whole weeks. 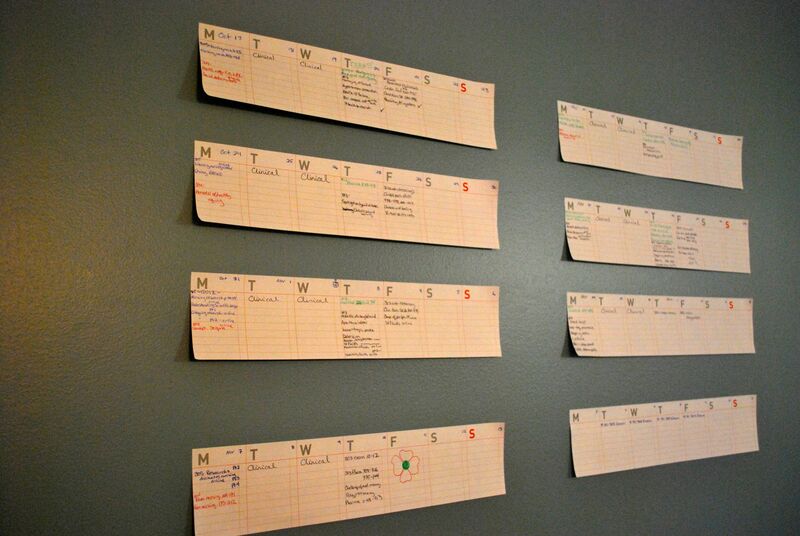 If I had done this when I started, there would be six more notes up there on the wall. Which means that when I take down this week I will be half way through. This has been the hardest thing that I have done so far with my life. The previous hard thing was when I picked up and moved to Chad for three months to do my practicum. But this, this. It’s hard to explain the challenge it has been. The drastic change in my life it created. Before, I lived in a city where I knew so many great people, had my husband with me each day, got to make pottery, make food, make friends. We travelled, I adventured. I didn’t work. Now, I’m in a city where most of the people I know don’t know me very well, and I’ve left my Prince Charming behind at home in SF. I’m so fortunate to have met new friends and reconnected with old friends and family. But you know how it is with new friends – there’s not that ease of the old friends who know your soul. And the work! Oh, the work. Going from making pottery and volunteering a few hours a week to being in class twelve hours a week, plus two 8 hour days of clinical, plus 2 hours of lab equals 22 hours a week of intense learning. Add on to that the MOUNTAINS of readings we have to do each week. It makes for a busy schedule. I have yet to feel like I’m living in Vancouver because I so rarely get out of my apartment to explore. It has been a serious adjustment. I have spent more hours crying than I would care to admit. But it’s getting better. Each day is a little easier than the last and before I know it, December will be here and I’ll have made it. Made it to the point where I said if I was still as miserable as I was at the beginning I would quit. But, I’m not quite ready to give up yet. I’ve got to keep going. So. Here it is. My 100th post of Fairy Tales of the City. This new city has yet to make the fairy tale status, but this heroine is facing the fiercest dragon she’s ever faced. Time to put on my helmet and armor, because I am tackling this beast. Armed with love from all of you. Wish me luck, some days I need it more than others.